Karlovic hoists the trophy high. Ivo Karlovic claimed his second title of the season after coming from a set behind to defeat Arnaud Clement 3-6 6-4 6-4 in the Nottingham Open final.The big-serving Croatian took advantage of an increasingly weary-looking Clement to conclude his preparations for Wimbledon in style. Number eight seed Clement began nervously and was taken to deuce in the opening game by the Croatian giant but it was he who gained the vital break of serve in the fourth game. Having saved one break point with yet another unreachable serve, Karlovic, the last direct acceptance into the draw, skewed the simplest of backhand volleys into the net to give Clement a 3-1 advantage.And the 29-year-old, who defeated the Croatian in the quarter-finals of Queen's last week, went on to serve out the remainder of the set.But the world number 61, who won in Houston earlier this year, pulled level, breaking Clement's serve in the 12th game to take the second set 6-4. The Frenchman came close to a break in the fifth game and rarely looked troubled on his own serve. Only Karlovic's serve remained constant, with one ace in the seventh game recorded at 153mph in the seventh - just 2mph short of Andy Roddick's world record. But that all changed in the 12th game. After saving three set points from 0-40 down, the world number 38 was beaten by Karlovic's passing shot to force a deciding set. And it was he who prevailed 6-4. Having had previous chances to break in the fourth game, he took advantage of the tiring Clement to make the decisive break in the 10th game. Having already saved two Championship points, the Frenchman was wrong-footed when his opponent's backhand ricocheted off the net cord and fired wide. 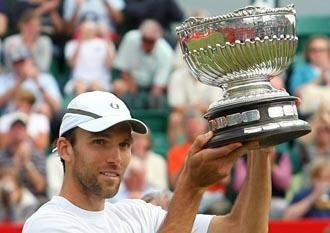 Nottingham - Ivo Karlovic of Croatia sent out an ominous Wimbledon warning by defeating Arnaud Clement of France 3-6, 6-4, 6-4 in the final of the Nottingham ATP title on Saturday. It was only the second ATP Tour title of the 28-year-old's career and his first on grass, which is seen as his best surface due to his booming services sent down from atop his 2.08m frame. His play was in stark contrast to the flyweight Clement one of the smallest players on the circuit who is entering the veteran stages of his career, but who has a lot of experience of playing on grass. The Frenchman grabbed an early advantage by breaking Karlovic's serve in the fourth game of the first set, the Croatian netting an easy volley at the net on break point. The Frenchman grabbed an early advantage Games went with serve until 5-4 for Karlovic in the second set when Clement played a loose game to allow the Croatian to wrack up three set points at 0-40. The Frenchman saved them all, but he could do nothing on the ensuing advantage point and Karlovic was level on sets. The deciding set was another tight affair and again it was in the 10th game that Karlovic did the damage, converting his third match point helped by a net-cord that sent his forehand passing shot careering past Clement's charge to the net. Ivo Karlovic edged out No 8 seed Arnaud Clement 3-6, 6-4, 6-4 to celebrate victory at the Nottingham Open. Croatian giant: Ivo Karlovic in action at Nottingham. Clement began nervously and was taken to deuce in the opening game by Karlovic but it was he who gained the vital break of serve in the fourth game. Having saved one break point with yet another unreachable serve, Karlovic, the last direct acceptance into the draw, skewed the simplest of backhand volleys into the net to give Clement a 3-1 advantage. Clement, who defeated the Croatian in the quarter-finals of Queen's last week, went on to serve out the remainder of the set. However, the world No 61 pulled level, breaking Clement's serve in the 12th game to take the second set 6-4. The Frenchman had shown few signs of weariness despite playing two matches yesterday and rarely looked troubled on his own serve. That all changed in the 12th game. After saving three set points from 0-40 down, the world No 38 was beaten by Karlovic's passing shot to force a deciding set. Karlovic continued his resurgence and triumphed in the final set to deny Clement a fifth career title.